Do you wish your bathroom had a little more personality? The quickest way to give a bathroom a style makeover is to change out the shower curtain. However, sometimes it's hard to find a shower curtain we love, and if we do, they can be way too expensive. If the shower curtains at local department stores are lacking in personality, consider a DIY shower curtain instead. We've gathered some beautiful shower curtain ideas that beginners and experts alike can tackle in a day or a weekend. Let these tutorials serve to inspire you and teach you how to add personal style to your bathroom. A quick and simple way to create an expensive-looking shower curtain is to repurpose basic drapery panels. Sarah from Room for Tuesday upgraded a pair of Ikea curtains that were long enough to install near the ceiling. Visit her page to find out how she added this elegant decorative trim to pull the look together. If you're having trouble sourcing a shower curtain that matches your design aesthetic, consider adding a unique spin by embroidering designs on a blank curtain. This tutorial from Design Love Fest will take you approximately three hours to complete and will be well worth the effort. Anita from Cedar Hill Farmhouse offers some insight when picking fabric for a shower curtain. She recommends large scale patterns with a short repeat. In other words, don't pick a fabric that is too busy and will dominate the space. Once your fabric is selected, follow along with this tutorial to learn how to add metal grommets. Cori from Hey, Let's Make Stuff had trouble finding a feminine shower curtain that wasn't over-the-top with ruffles and other embellishments. To create the look she wanted, she converted a flat sheet into a shower curtain and then added subtle feminine details using flower trim. Do you like the final result? Check out her step-by-step instructions to learn how to make one, too. Sometimes the ready-made shower curtains don't match our bathroom for whatever reason. If that's the case, paint the shower curtain in a shade that brings out all the best features in your space. Bethany from Dwellings by DeVore opted for a coral color that she couldn't find anywhere else. In this tutorial, she shows you how to tape off the curtain and paint it, so the stripes come out elegant and crisp. Erica from Honestly WTF uses a shower curtain to draw attention to this small bathroom's high ceilings, which gives the illusion of a larger space. To do this, she opted to make a DIY shower curtain that is 10 inches longer than a standard curtain. 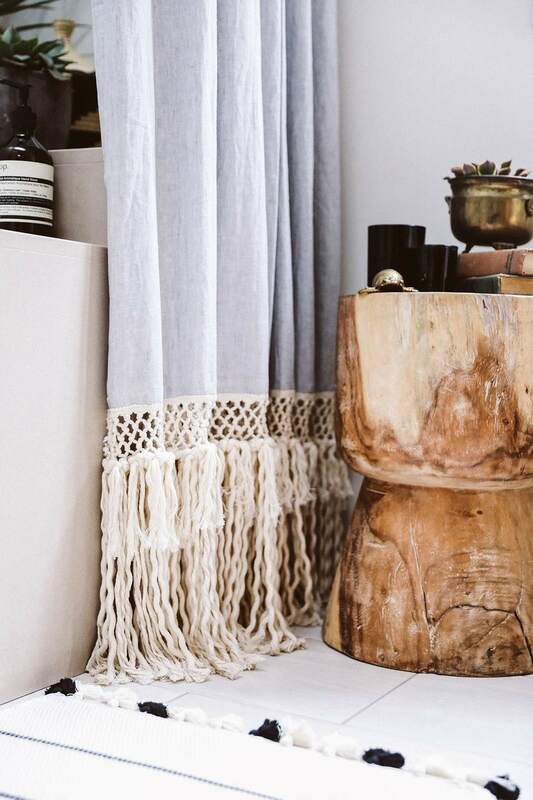 This clever tutorial will show you how to add that length using macrame trim. Adding a touch of whimsy to your bathroom can get expensive. Many designer shower curtains can cost around a hundred dollars or more depending on the detail involved. If you like sewing and have a ton of scrap fabric around the house, consider doing what Erica from Spoonful of Imagination did. She sewed bands of ruffled fabric onto a drop cloth and then created a DIY shower curtain tutorial explaining every step in detail. When you can save money by making your own shower curtains, you don't have to feel guilty changing out the curtain multiple times a year. Such was the case for Emily from The Wicker House. When she took a liking to Swiss Crosses, she decided to turn an old towel into an emblem on her shower curtain. Find out how to do it yourself by reading her how-to. For those of us that don't own a sewing machine, this DIY shower curtain tutorial from An Oregon Cottage is a perfect starter project. Jami offers a thorough breakdown of her stenciling method, and the end result looks like it could be in a magazine. According to the tutorial, you can use acrylic paint you have on hand if you mix it with a fabric paint medium. If you have an extra white bed sheet you're not using, follow along with Jill from Sew a Fine Seam and learn how to transform the sheet into a shabby chic DIY shower curtain. You'll also need a wide panel of delicate lace and some burlap ties to get started. This shower curtain idea might seem unusual at first glance. The thought of a sweater-like material in the bathroom may be unappealing to you, or you may think it's brilliant. Either way, Lynne Knowlton breaks down her thought process and teaches you how to make a similar conversation piece in your bathroom. There are many different ways you can dye fabric for a quick makeover. Jeni from In Color Order showcases a common tie-dying technique in this DIY shower curtain tutorial. Her guide will show you how to get a similar pattern to what's shown here and will also provide several other examples of how to tie off fabrics for different results. The final product is completely one of a kind and will add a free-spirited, whimsical element to any bathroom.